Whilst it would be possible to own these already on CD this box is aimed at the vinyl crowd. Music wise there is nothing much to argue about, with the possible exception of the Visions all the tracks here are absolute classics of the rocksteady or early reggae eras. Three of the recordings here; Way Of Life, I’m So Proud and Chattie Chattie have featured in the DanceCrasher 100 Best Rocksteady Tunes and several more would undoubtedly feature in any similar list for early reggae (but don’t worry we’ve no plans for that!). The quality of these is the same as on the recent limited edition 7″ single issues with heavy weight vinyl and excellent sound quality. Add a sheet of well written and informative sleeve notes and of course the box itself and you get a very well presented release . 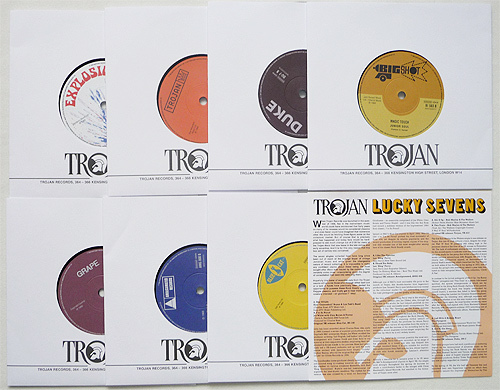 The only real negative is the cost which at £50 seems a little on the steep size though Trojan would no doubt argue that to buy all seven singles on original issue you’d have to pay more than ten times as much.